Our painted and mango chests of drawers feature excellent storage and great style for your bedroom. There's no wonder why our painted and mango chests of drawers remain so popular with our customers. They perfectly blend high style with fantastic function to create a stunning piece of bedroom furniture. Boasting plentiful storage, and delightful finishes, there's a place in every home for these beautiful chests of drawers. Each chest of drawers is designed with the utmost attention to detail. Hardware has been carefully selected to pair with the overall look. Only 100% solid hardwood has been used in the piece; even drawer backs, runners, and bases! 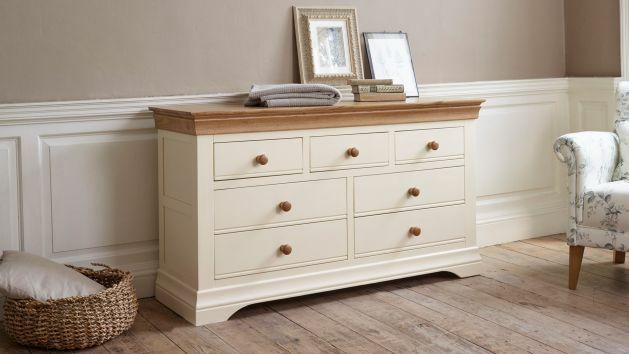 The drawers are also finished with dovetail joints, which have incredible strength and durability, ensuring that your chest of drawers will last for years to come. Browse our full selection of painted and mango chests of drawers below!